For a culinary tapestry as rich and diverse, Parsi cuisine has for a long time remained circumscribed by stereotypes, identified largely by the dhansak-sali boti routine popularized by Mumbai’s iconic Irani cafés and Parsi eateries. Of course, more recently, speciality Parsi restaurants have been opening doors outside Mumbai, Irani café classics have begun making routine appearances on menus at modern Indian eateries, and there’s increasing interest in the cuisine in general. Parsi food has evolved over a thousand years, since the first boatful of Irani refugees landed in coastal Gujarat, through a dynamic route of assimilation and adaptation, buffered by an almost obsessive love for food. Outside the Parsi community, however, few have known the tongue-tingling deliciousness of pickled roe, the early morning comfort of sweetened milk froth flavoured with nutmeg and a hint of cardamom, the delicate wobble of topli na paneer, or the ecstasy-inducing virtues of eggs cooked, unhurried, on a bed of clotted cream. “We also cook fresh prawns on clotted cream," says Kurush F. Dalal, who balances archaeological expeditions and an immensely popular catering business, Katy’s Kitchen, that he runs along with wife Rhea in Mumbai. Incidentally, Dalal is the son of the legendary Katy Dalal, the author of the iconic cookbook Jamva Chaloji, and he is a mine of information on Parsi cuisine and culture himself. “This dish is called malai ma kolmi, but we call it heart attack on a plate," he adds. The Dalals, old players in the bhonu (a special Parsi feast) game, turn out quite a few culinary gems at Katy’s Kitchen. Take, for instance, the chicken maiwahllan, an heirloom Parsi recipe for chicken baked in egg whites and cream with lots of dried fruits and whole yolks. Or the gos no batervo, a rustic, village-style preparation where the marinated meat is slow-cooked in palm toddy until it simmers down to a deliciously sticky, sweet and sour gravy. “The dish, best cooked on a wood fire, was invented by one Mr Valsara, who had cooked it for Lady Navajbai Tata, wife of Sir Ratanji Tata," says Dalal. “Even years later, Lady Tata would insist that it was the best dish she had ever sampled," says Dalal. The archetypal bawa’s soft spot for toddy is perhaps rooted in the community’s agrarian roots and at one point (before prohibition in Gujarat), there were quite a few who minted money selling toddy—but that’s another story. Toddy lends itself well to their cuisine. From tari no bhakhra (a kind of doughnut) to boomla (Bombay duck cooked in toddy with vinegar, jaggery and spices), there are some stunning toddy-infused dishes that are still turned out in the Parsi towns and villages of Gujarat. In fact, the Parsi repertoire of rustic dishes is outright incredible and steeped in curiosities. Take, for instance, the meaty metamorphosis of the humble Gujarati undhiyu, a seasonal mixed vegetable dish, to umbhadiyu. The vegetables used in umbhadiyu are cooked with meat in an earthen pot, placed upended (the mouth sealed carefully with local bush) in a pit dug in the ground, which is then covered with a huge pile of mango leaves to make the fire, under which the preparation is slow-cooked over a few hours. Besides, there’s the delicious sweetened milk froth, doodh na puff, typically prepared by leaving reduced milk out in the open overnight, and the tarela boi (mullet) that no pilgrimage to holy Udvada is complete without. As younger generations of Parsis moved from the villages of Gujarat to cities like Mumbai, and beyond, they carried with them their love for food, picking up different culinary influences on the way and seamlessly incorporating these into their cuisine. For instance, Tanaz Godiwalla, often dubbed the queen of lagan nu bhonu (the Parsi wedding feast), turns out a Parsi-style fish vindaloo—the khermoteli—distinctly different from the more popular Goan vindaloo. Or there’s kid nu gos, goat meat cooked in creamy cashew and coconut gravy, that used to be the highlight of weddings catered by Godiwalla. ‘Bheeda par eedu’, or eggs with okra. Both coconut and kokum (a souring agent) are Goan contributions to Parsi food, just like the sauces and custards came from the colonial masters. The feted patra ni machhi (fish laced with a green coconut chutney, wrapped in banana leaves and steamed), another Godiwalla speciality, owes its origins to the Goans too. “There was a time when many Parsi households had Goan ayahs (nannies) and cooks, and through them some elements seeped into the Parsi cuisine," says Kainaz Contractor, who, along with chef Rahul Dua (of Café Lota fame), opened the quaint 18-seater Rustom’s Parsi Bhonu in Delhi a couple of years ago. With popular favourites in place for the less adventurous diner, the menu at Rustom’s features a few lesser-known stunners like the chicken vindaloo prepared with sarko, a barrel-matured sugar-cane vinegar imported from Navsari’s legendary E.F. Kolah & Sons (established in 1885). A treasured ingredient in a serious Parsi pantry, it gives some signature staples like the deliciously sweet and sour masoor ma gos, a winter favourite in Parsi homes, that distinct tangy kick. A prized dish on the menu at Rustom’s is the dhan dar patio, perhaps the best example of Parsi comfort food. “This is a perennial favourite in Parsi homes and I have grown up eating it thrice a week," says Contractor, who has rummaged through family archives and consulted friends and relatives living in different parts of the country to come up with her evolving menu at Rustom’s. Dhan dar is rice topped with creamy toor dal, tempered with garlic, and ghee. It is paired with a sweet and sour curry—the patio, ideally made with fish or prawns. The Parsis may have inherited their love for fish and prawns, from their coastal beginnings, but it is the average bawa’s meat fixation that is legendary. And when we say meats, we mean offal too. Parsis love their bheja-kaleji-bukka as much as they love their boti. Trotters cooked with black-eyed beans or turned into jellies, bheja (brain) cutlets with a frilly crust (legendary stuff) and the delicious aleti paleti, mixed offal, typically served for breakfast. And vegetables? 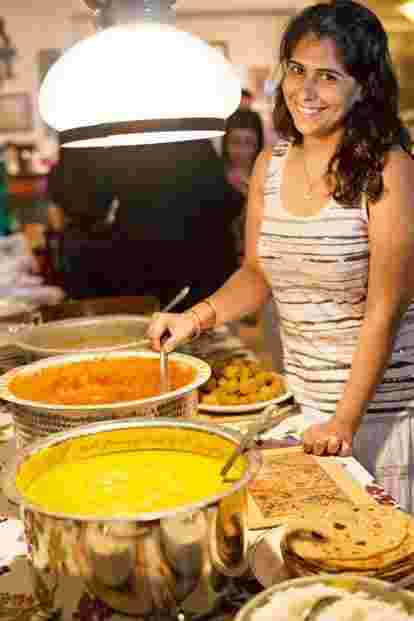 “The only way to include veggies in a Parsi diet is perhaps by adding meat to them," says Perzen Patel, better known for her stellar blog, the Bawi Bride. A unique dish in the Parsi repertoire, the papdi ma kebab, is a case in point—small minced-meat kebabs are added to broad beans. Parsis also cook cluster beans (gawar) with prawns and an incredible summer recipe calls for chunks of kakri (Armenian cucumber) slow-cooked with mutton. But the most iconic Parsi combination of meats and greens may be the bhaji dana ma gos, cooked with green peas and greens like spinach, fenugreek and dill. “Traditionally, the bhaji dana ma gos and khatto meat were mandatory at Parsi wedding feasts that were wall-to-wall mutton affairs," says Dalal. Of course, the cuisine is famously dependent on meats, fish and eggs, and that posed quite a predicament when Coimbatore-based brothers Vikram Mohan and Uday Balaji launched Chennai’s first Parsi speciality restaurant, Batlivala & Khanabhoy, in February last year. “Chennai has a huge vegetarian population that we couldn’t possibly alienate. It wasn’t an easy task, but at the end we could unearth almost 30 unique Parsi vegetarian dishes," says Balaji. He has included dishes like ripe guavas cooked in coconut milk gravy, suran (yam) cutlets spiced with Parsi garam masala and lagan sara istoo, a sweet and sour stew made with a medley of root vegetables, typically served at Parsi weddings. Parsi cuisine’s quintessentially non-vegetarian character is best demonstrated by the feted lagan nu bhonu, where every course is essentially non-vegetarian. “The only vegetables served at a Parsi wedding are perhaps in the form of the achaar (pickle) served right at the beginning," says Godiwalla. But on any regular day, what tops the list of bawa favourites is egg. Akoori, perhaps the best-known Parsi egg speciality, does not even begin to represent what’s possible. At Pala Fala in Mumbai, an entire section of their Parsi menu is dedicated to eggs in addition to home-style Parsi signature dishes like potato ma gos, Parsi-style mutton and potato curry, and jerdaloo boti, chunks of meat cooked with apricots and topped with crisp potato straws. There’s kheema par eeda, eggs on a bed of spicy minced meat, bhaji par eeda, cooked with fenugreek, sali par eeda, on a bed of potato straws, and the bharuchi akoori, a platter of scrambled eggs with dried fruits. “Parsis love eggs, we do not understand the relationship between eggs and cholesterol," says Dalal. And they are hardly intimidated by calories. “The original recipe for the bharuchi akoori, for instance, stipulates 600g of ghee to make a batch just enough for four," says Patel. If you thought things couldn’t get crazier, try the delicious eeda pak, Parsi-style egg halva, an intricate recipe that calls for a preposterous number of egg yolks. This eggy sweet apart, there are many other Parsi favourites beyond lagan nu custer, from the dodhi no halvo loaded with dried fruits to sev-mithoo dahi (cooked vermicelli served with sweetened yogurt). Parsi cuisine, then, is as rich and intricate as the community’s history in the country. So, look beyond dhansak. And while you’re at it, try some gharab nu achaar—pickled whole roe of bhing (hilsa).